On Tuesday, March 1, the VisualDx experience will change. Double the diagnoses. 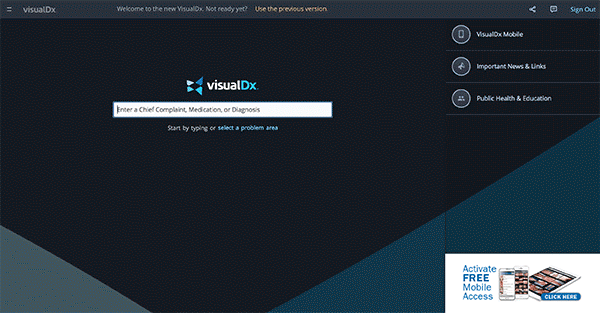 From 1,300 to 2,700 diagnoses, VisualDx will provide a more holistic decision support. NEW The Sympticon™. Look for these symptom icons to visually demonstrate symptoms of disease. NEW More Images. The world’s best medical image library has expanded to include more photos, x-rays, and now the Sympticons. NEW Guided Questionnaires. Choose to be guided with a questionnaire and/or type in additional findings. VisualDx can help you remember which questions are relevant to a particular symptom or complaint. Concise expert content and therapy guidelines for use at the point of care. Patient handouts for key diagnoses. Integrated into the workflow: mobile, electronic health record, UpToDate.